elemeni anti-aging radiance face oil for normal complexions featuring the finest precious Bulgarian rose otto (essential oil) formulated in an intensive healing treatment for environmental damage, fine lines and wrinkles, rosacea and scarring. 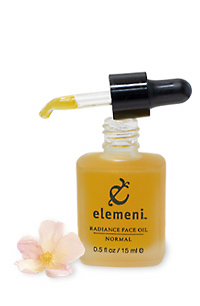 elemeni Radiance Face Oil Normal Complexion Formula (over 97% organic content) is a synergistic blend of exquisite pure organic oils that can help revitalize mature complexions and restore dewey radiance. The secret is the rare Rosa Moschata oil from the Andes Mountains known for its high content of essential fatty acids—oleic, linoleic, and linolenic—all important for healthy skin. Amazingly light and non-greasy, our Pure Plant Origin formula is free of petrochemicals so it magically absorbs to nourish your skin without leaving oily residue. It is pure enough for application on the delicate skin around the eyes. Use in the morning and before bedtime - the aroma of the precious rose, mandarin and sandalwood is divine. This little wonder is probably the best facial oil I've used. Unlike others I've tried that actually caused redness and seemed to be counterproductive, this elemeni oil does the opposite. My skin feels softer, looks more radiant, calms the redness, absorbs easily. I could go on and on. And, you really only need a drop or two. So this will last you longer than you think. A first rate product; try it, you'll love it! I have heard a lot about "natural" face oils to fight age, etc. I got the trial size to test this product out. Wow. I loved it, and plan on buying a full size the next time I order. The oil was so thick and spread smoothly over my skin. It smelled wonderful and I did not have any reactions at all with the product. I could feel a difference, though it was not a chemically-induced difference. What a nice change. Every product I use from this company surpasses my expectations. I have combination skin and ordered the normal complexion facial oil. At night I use two drops on face and neck and during the day I only need one drop. I am chemically sensitive and all of their products work for me just fine. I found this product after suffering with severely dry skin. Lotions would burn and I couldn't find anything to actually even out the texture until this. I have used it for years and wouldn't use anything else. I like that you only need a few drops. I also don't look my age which is nice. Please never quit producing this face oil. It is incredible. One little dropper full covers my entire face and neck and my complexion is clear and soft all day long. I don't wear makeup. Don't need to!! I really didn't know what I was in for when I ordered this - I had a coupon and just wanted to try it. I'm in love. They are right when they say use just 1 drop. I use 1 drop in the morning, and sometimes 2 drops at night for the added effects without worrying about being greasy. My skin is super dry in the winter, but greasy in the summer, usually increased with commuting via humid subway every day. So I picked normal, even though it's far from normal and usually some amount of pimples and dullness at all times. The first few days I wasn't quite sold yet, but I kept using it and about 1 week in, I was more than sold. My skin looks beautiful. I've actually gotten compliments (which shocked me each time). 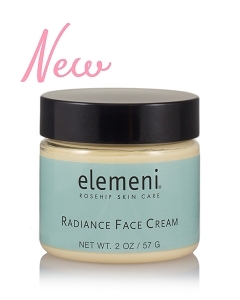 It seems to add some sort of radiance, but at the same time a small amount of moisturizing. In the warmer weeks, I would use toner and this and that's all. Now the temperature is dropping, so I use toner, this and hardly half a drop of the rescue cream. It's a cocktail for perfect skin that stays the same all day - and consistent. One drop at a time, I think this bottle may last forever. The price seems steep, but the value is high in looks, feel, and time that it will last for. If I ever run out, I would definitely purchase again without a second thought. When I think of Mex Green Alchemy I think of a trusted friend. My heart tells me you are genuine in your care and concern for we your customers! I have been using the shampoo and conditioner for some time now and love it! 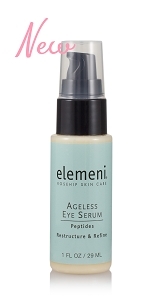 I have been using Elemeni as part of my face care regemin and may soon use it full time as I love how my middle age skin feels and looks actually! Of course having my daily face care include a sunscreen would be the cherry on the sundae!!! Thanks for all you do! I use this every morning before I put on my makeup. Its not greasy and is the perfect consistency. I love it so much. It moisturizes my face just the right amount. I also use it after I've been out in the sun, and my face never peels. I was extremely unsure about this product but decided to take a chance because everything else I have ordered from MGA has worked so well. I am 41 and my skin has never looked this great! I have been using the elemeni face oil for 1 week and I just can't stop raving about my complexion. I live at the beach and I have years of sun damage,but my skin feels so NEW and smooth. The look is unbelieveable and the scent is delicious. I usually stay away from things with a scent do to sensitivity(hence why I love MGA naked rescue cream! )but this is so natural and it gradually diminishes. My husband keeps asking me why I smell so fresh. Thank you Max Green Alchemy! Please dont ever stop making these products. Your customer service is the best I have ever experienced! Q: I'd like to buy three and get the discount, but I'm concerned about how long the oil is good. Is there an expiration date? A: We would recommend using opened bottles within six months and unopened bottles within twelve months. You can extend this shelf life (for both) by storing the bottle in the fridge. Rosa Moschata* (Rosehip) Seed Oil, Helianthus Annuus* (Sunflower) Seed Oil, Prunus Armeniaca* (Apricot) Kernel Oil, Daucus Carota (Carrot) Oil, Rosa Damascena (Bulgarian Rose Otto), Tocopherol (Natural Vitamin E), Citrus Nobilis* (Mandarin), Santalum Album^ (Sandalwood), Boswelia Carterii (Frankincense), Lavandula Officinalis* (Lavender), Calendula Officinalis* (Calendula), Ascorbyl Palmitate (Vitamin C Ester).